There has been many questions posed to me lately about fire safety from clients who are fearful of torching their home when burning candles. I live with such a person, but I myself have had over 20 candles for clients burning all at the same time and (get this!) I have left town for business purposes and left the candle burning! I have never had any problems with candles once I learned the proper way of setting lights safely. Before I learned, I had quite an experience! 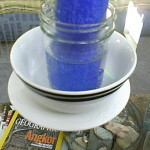 Very early on in my candle burning days, I lit a Seven African Powers candle and sat it on a glass table with wooden legs that was on hardwood flooring. I left the house a couple of hours later for a party nearby. We dined and were sitting around the backyard conversing in the oncoming twilight when all of a sudden, I got an overwhelming urge to go home. I was panicky, and I left my then spouse and children at the party to drive the short distance home. 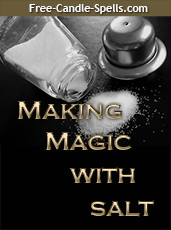 When I arrived, the candle glass had cracked and the liquid wax had ran across the glass table top and was dripping onto the hard wood floor. Fortunately, flames had not followed the trail of liquid wax, but this taught me a lesson that I had to be more careful. 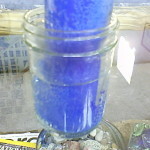 So this blog post will show with pictures the various ways to protect your home from fire when leaving candles burning for your candle spell. It is considered better to leave the candles burning as constant energy that is being applied to your petition or cause, but with kids, the cat, frilly curtains, fears and petition papers being present in your environment as well, these photos should give you a good idea on how to protect your home and loved ones. 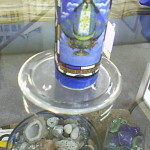 There are some tradition metal candle holders that you drop the glass candle in. 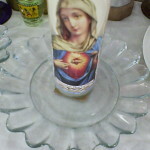 Here is one example of a votive holder but my Puerto Rican madrina had some crudely fashioned tall metal candle holders for the 7 day novena type candle in glass that we commonly use for candle spell work. Then there are Pyrex pie plates, like I use when burning a bunch of candles together. These are relatively inexpensive at your neighborhood Wally World and since the glass has been tempered for use in the oven, you can bet that it can hold temperatures of at least 450 degrees with ease. 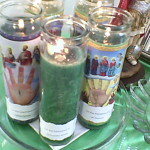 Other methods of safe candle spell burning are shown in these photos below. We have the candle sitting in a jelly jar with water, a candle on one of those thick candle ‘plates’ from Pier 1 or Cost Plus Imports, a candle on a clear glass plate I picked up from the dollar store and for those who are truly fearful of fire, a triple protected candle with the candle in the jelly jar of water, in a bowl, on a plate. Even kitty won’t tumble that one!